Rin and Yukio have been sent by Mephisto to rescue Shura, only to find her in the clutches of the demon Hachirotaro Okami. When Rin attacks the serpent, using his Satan Bomb move, Shura realizes he has gained greater control of his flames. He’d been against the name at first, finding it stupid, but she explained to him that it would be easier for him to remember, and she turns out to be right. The brothers rescue Shura but the serpent escapes. Shura can’t help but remember when Father Fujimoto asked her to watch over the twins, although she was less than interested, and she wonders if he foresaw this day. They use a key to get back to True Cross, and Yukio winds up in the infirmary, to his chagrin. Rin tells him to get better and then he can go back to his special training, whatever it is. Shura starts to talk to Rin about what happened to Yukio in Aomori, then decides against it. Meanwhile the search for the demon serpent is on, but unfortunately someone on the other side finds him first and turns him over to Lucifer and his forces. After she recovers, Shura goes to see the director and learns the serpent has been given to the others. They suspect Shima, but have no proof, since he is a double agent. Shura asks Mephisto if all of this is part of some big plan of his, but as usual he is cagy, and remarks that she cares more about others than she used to. Back at the dorm, Rin is practicing grilling fresh fish, so he can cook for Yukio in the hospital. The others tell him he won’t be allow to grill there, much less with Satan’s flame. They find Bon hanging out Lightning’s laundry and make fun of him for allowing him to use him in that way, but he explains that he is trying to attain a state of selflessness, so they let it go. Lightning takes Suguro to the underground library of the True Cross Japan branch, which is huge. Lightning got them permission for five days of research, and he intends to investigate the Illuminati. He thinks everything that is going on began on the Blue Night. He’s sure Mephisto knows the truth and he intends to make him talk. Things are really getting good in this volume, especially trying to figure out everyone’s hidden agenda. Since her rescue by the Okumura brothers, Shura has become more human and likeable, although I could do without the skimpy outfits. Shima is an enigma. You want to intensely dislike him for being a spy, and yet there is something compelling about him that makes you want to give him the benefit of the doubt. One of the funniest parts of the book involves Rin’s confession to Shiemi that he likes her, and its aftermath, which involves the return of someone Rin cannot stand. Lightning isn’t the punk I first took him for, and his investigation of the Illuminati, along with Bon, is becoming very interesting, especially if it leads in the direction I think it is. Another great volume from Kazue Kato, I look forward to the next one. 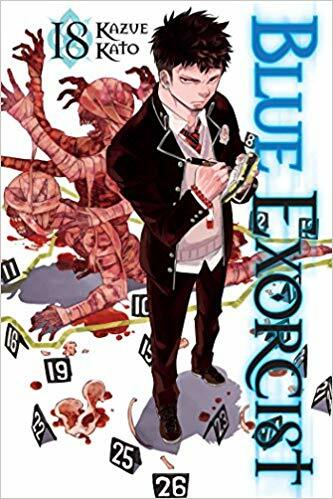 This entry was posted in Reviews and tagged Blue Exorcist, Book review, Exorcist, Julie Lynn Hayes, Kazue Kato, manga, Viz Media on January 26, 2019 by wedbriefsfic.